WeaKnees Blog » Blog Archive » Rebooting DIRECTV TiVo DVR Roundup – What to do? Rebooting DIRECTV TiVo DVR Roundup – What to do? For probably over a week now, there has been an extreme upsurge in the number of reports, phone calls, emails, chat sessions, forum postings, and blog postings, about rebooting DIRECTV TiVo DVRs – all models except the THR22, a TiVo built on DIRECTV’s hardware. We first realized the true extent of the problem a few days later, and initially posted about it here, on our blog, on November 15. Since then, we’ve posted a few more times. Once was when we heard from an internal DIRECTV source who acknowledged the issue. 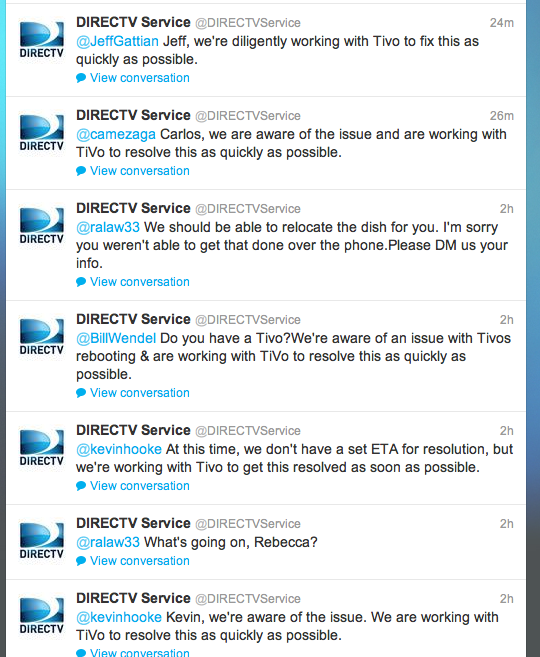 And then next was when DIRECTV seemed to go public with recognition of the problem via their Twitter stream. So here we are, a week and a half later, and rather than being able to say that the problem has been resolved, we have to start looking ahead in case the problem won’t get solved. Without any concrete data about DIRECTV’s intentions and plans, and with at least ten days of rebooting units around the country, we are laying out the alternate solutions that we see. But, just to be clear, we really do think DIRECTV will resolve the problem. We just don’t know what the timeline is. Go to cable – There is definitely a very vocal group who expressed feelings that DIRECTV is purposely trying to disable these units in order to stop having to pay TiVo their monthly fees. These customers are responding with loyalty to TiVo, egged on by their assumption of nefarious tactics by DIRECTV. We have to say, we have NO evidence at all that this was an intentionally caused situation, and we do think DIRECTV would like to resolve it. That said, for TiVo partisans who are considering cable, the current TiVo DVRs for cable are fantastic machines and have many, many more capabilities than DIRECTV’s DVRs and TiVos do. Make the jump to HD – For another group of our customers, this is just the push they need to get over the hump and move to HD. Now that there is the DIRECTV TiVo DVR THR22 out, these TiVo lovers can move up to HD and still keep their TiVo interface and remote. The downsides to this option are that the monthly fees will likely increase – there’s the HD fee ($10/month) and possibly the TiVo fee ($5/month) in addition to the DVR fee ($7/month) that customers are likely already paying. If, on the other hand, a customer has a DIRECTV TiVo with lifetime service on it, then, as far as we know, the latter two fees ($5 and $7) are covered by that program, and the only change would be the HD fee (customers should confirm with DIRECTV regarding their account). Further, if a customer already has an HD unit on their account, they are already paying that fee, so there is no increase in monthly fees, just the upfront cost of the hardware. Consider that you may not have this problem – Whenever a problem of this magnitude arises, everyone just assumes they have this problem, but not everyone does, and they don’t realize that until the problem subsides and they’re left with a problematic DVR. Rebooting is generally the sign of a bad hard drive. If you had significant rebooting in, say, October, you likely do have a bad hard drive. See our TiVo hard drive replacement kits. There are also tuner problems (generally pixellization) and power supply problems and plenty of other things that happen. Pull your SAT cables and watch recorded shows only – Since the problem seems to be due to the signal DIRECTV is sending down, you can pull your SAT cable(s) and just watch pre-recorded content without fearing the reboot. Many people have reported that this works fine – further fueling the fire that DIRECTV’s signal is causing this. Of course, you can’t record anything or watch live TV without the SAT cables connected, but you could watch a movie in peace. Sit tight and wait it out – This is definitely a tougher option for anyone who watches even a modest amount of television, but if, for example, you’re going out of town for Thanksgiving, that gives DIRECTV a few days to figure out what’s up and potentially resolve the issue. And, again, we do believe they are working on it. according to directv….a solution should be sent out by midnight tonight. just got off the phone with service.